Since last month, I’ve been throwing and attending a lot of house parties. And at house parties, we need finger food. What is better than chicken wings? I’ve been making baked chicken wings over and over again. I stumbled upon this recipe by accident. While visiting my aunt in Singapore, she showed me all the recipes she compiled over the years. Some are passed down to her from her family, others from cooking classes she attended and some are from newspaper clippings. 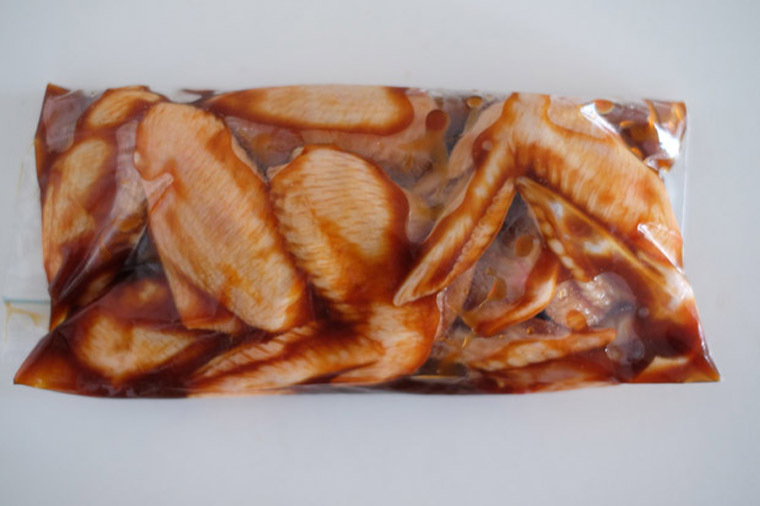 I When I saw ‘Marmite Chicken Wings’, I knew I have to try it (I love Marmite!). Easy and delicious chicken wings with a hint of Marmite. Step 1 Gather ingredients and tools. Step 2 MAKE SAUCE: In a bowl, add Marmite, sesame oil, oyster sauce & honey. Mix well. Step 3 CLEANSE & PAT DRY CHICKEN: Rinse chicken in running water, drain water, pat dry with paper napkins and transfer into a ziplock bag. Pour in marinade. 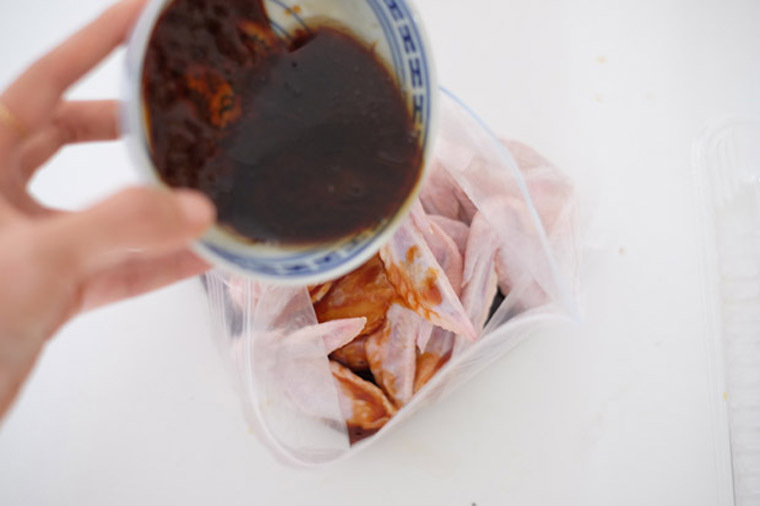 Lock and shake the bag well to ensure that marinate covers all parts of chicken wings. Step 4 MARINATE: Leave for 30 minutes on the counter or overnight in the fridge (The longer you marinate, the better it taste). Step 5 PRE-HEAT OVEN: Turn oven to 180 degree to preheat it while waiting for marinate sauce to infuse into chicken wings. Tear aluminium foil to line the baking tray to ease cleaning (optional). Step 6 BAKE: With a spoon scrap marinade off the chicken. Place chicken wings, skin up, on baking tray. 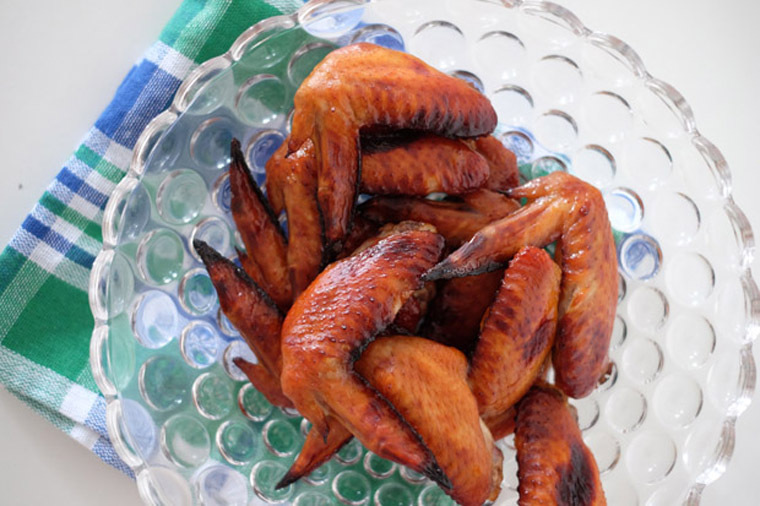 Bake wings for 20 – 25 minutes until chicken turns brown. Step 7 BROIL: If you want the skin to crisp, turn on the grill/broil function at the last 3 – 5 minutes. Step 8 SERVE: Let chicken wings cool for 5 minutes before serving. 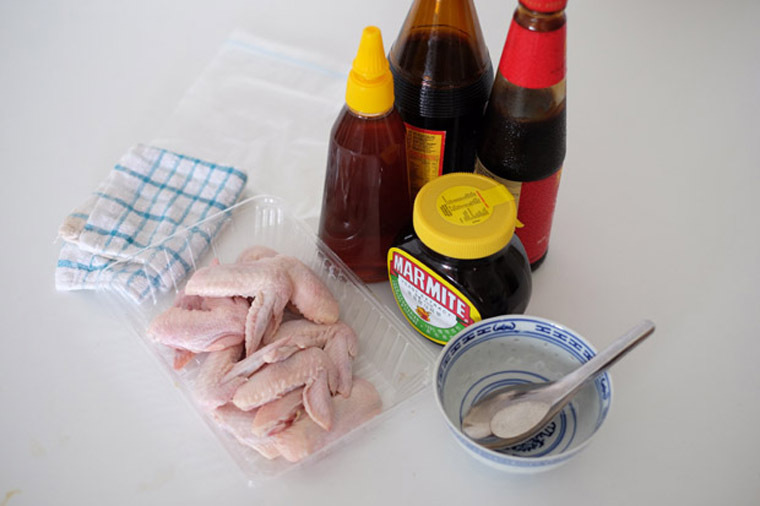 Marinate 500 g chicken wings in 1 tbsp Marmite + 1 tbsp sesame oil + 2 tbsp oyster sauce + 2 tbsp honey. Scrap marinate off chicken. Baked in preheated oven for 20 – 35 min @180 degree. Grill/broil for 3 – 5 min. 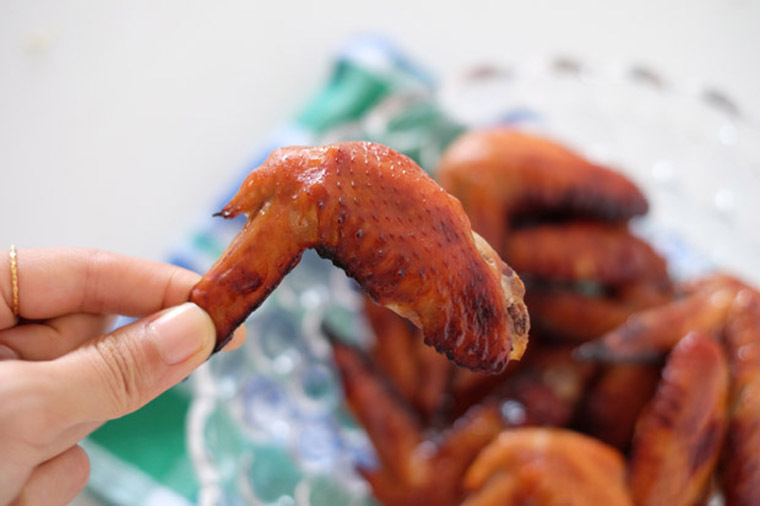 I chose to buy chicken wings center with tips (without the drummets) for two reason: One: the the thicker part of the drummets take a longer time to cook. Baking one part of it means my chicken will cook evenly. Secondly, I realise its a popular part amongst my family and friends (I also personally prefer this part over drummets). Since drummets are the second choice and leftover, why not only buy the wing center with tips? 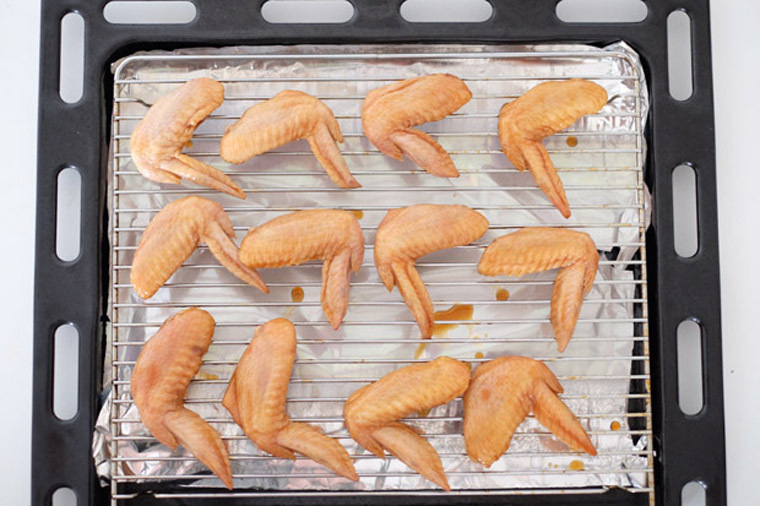 If you don’t have an oven, you fry the wings on a pan, about 2 – 3 minutes each side, or until cooked. If you don’t have a ziplock bag, you can marinate it in a bowl with cover. However, as I know that sometimes we just don’t have time or foresight to marinate overnight. A ziplock bag ensure that marinate seems in faster as more surface area of the chicken is enveloped by the sauce. I cook the remaining marinade sauce until it boils and drizzle over baked chicken. So delicious!